Patrons of I Lov Guitars who sign-up to their newsletter will receive a free customizable mil-spec dogtag from MyDogtag.com. Makes an ideal ID tag for attaching to your guitar case or amp! Offer limited to first 500 sign-ups. You must first sign-up to their newsletter via I Lov Guitars to obtain your unique promotional coupon code. Row 5 has fixed text of I LOV GUITARS and cannot be customized. If you decide to purchase additional items with your I Lov Guitars dogtag, a flat rate shipping fee of $5 will be applied. 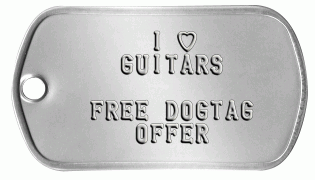 Make your FREE 'I Lov Guitars' Dogtag Now!